These Homemade Peanut Butter Eggs are a perfect homemade Easter candy and they can be ready in under an hour! This recipe is one of my easier candy recipes. It consists of a simple creamy peanut butter filling surrounded by a chocolate shell. Fun to make with kids! Are you ready for Easter recipes yet? 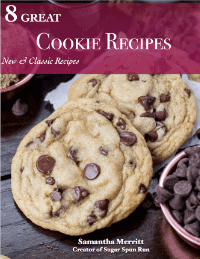 How about springtime recipes? After a cold, wet, winter, I’m ready for warm weather, sunshine, and all things Spring! Starting with these homemade peanut butter eggs that would be perfect for your Easter basket but also maybe totally perfect for munching on all season (all year?) long. 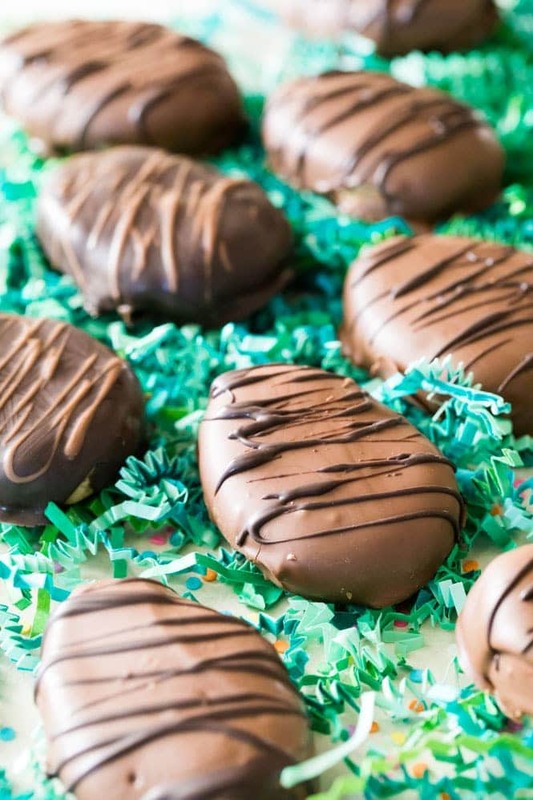 The filling for these Peanut Butter Eggs is based off of my Buckeye recipe. It’s essentially the same easy-to-make, easy-to-manage, creamy, peanut-buttery filling shaped into an egg shape and hidden beneath a slick chocolate coating. This recipe makes me think of a Reese’s Egg, only better. Easy to make, maybe a little messy (I’m unfortunately not so great at keeping my powdered sugar from flying everywhere and not getting chocolate all over my countertops, but if you are your mileage will vary), but simple and so good. Peanut Butter. You’ll want to use a creamy peanut butter. I don’t recommend using a natural variety (the kind that separates and needs to be stirred before using). Your eggs will most likely end up too sticky and oily that way. Butter. This is one of my rare recipes where I actually use salted butter instead of unsalted. However, if you only have unsalted on hand you can add 1/4 teaspoon of salt to your batter to make your peanut butter eggs. Brown Sugar. This is optional, but I recommend it for a subtle depth of flavor. Some people have complained that they can detect the grittiness of the brown sugar in the end product. I’ve never had this happen and think it might have to do with the brand of sugar. I use Domino Sugar and make sure I stir the sugar in really well with the butter. Powdered Sugar. Keep the mixer on low speed as you add the sugar to keep it from flying everywhere. I usually end up wearing a good bit of mine because I’m impatient. Start by scooping about two tablespoons of your peanut butter “dough” into a ball. Give the dough a little squeeze to make sure it clings together without crumbling. If it does, roll it between your palms to form an egg shape (if it doesn’t, see my tips below). You could be done here and have a round egg shape, much like my Easter Egg Candy recipe, but I was going for more of a Reese’s Peanut Butter Egg look. To achieve that, place your egg on a clean surface and use your palm to gently flatten it. If needed, use your fingers to smooth over any cracks or properly round the edges. Voila. Perfect Peanut Butter Eggs. The peanut butter filling here is pretty much foolproof. If it’s too sticky to manage, you can fix that by stirring in more powdered sugar, a Tablespoon at a time. If it’s too dry (test it first, the dough will look dry but if it clings together when you work it in your hands and is moldable it’s perfect) you can remedy that by stirring in just a splash of milk. Don’t freeze your eggs for too long before coating with chocolate. It makes the chocolate likely to crack as the peanut butter interiors warm back up to room temperature (learned this one when making my Oreo Balls). If adding sprinkles, add them immediately after dipping your peanut butter eggs. The chocolate hardens fast and you only have a small window to add the sprinkles. Peanut Butter Eggs will keep for several days at room temperature or for up to two weeks in the refrigerator. No matter where you keep them, I recommend storing in an airtight container. Any other Spring-specific recipes you’d like to see this season? 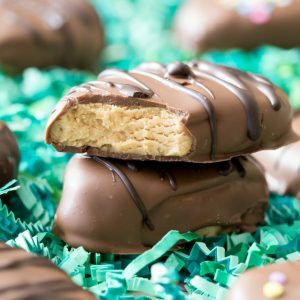 These Homemade Peanut Butter Eggs are a perfect homemade Easter candy! This recipe is one of my easier candy recipes. 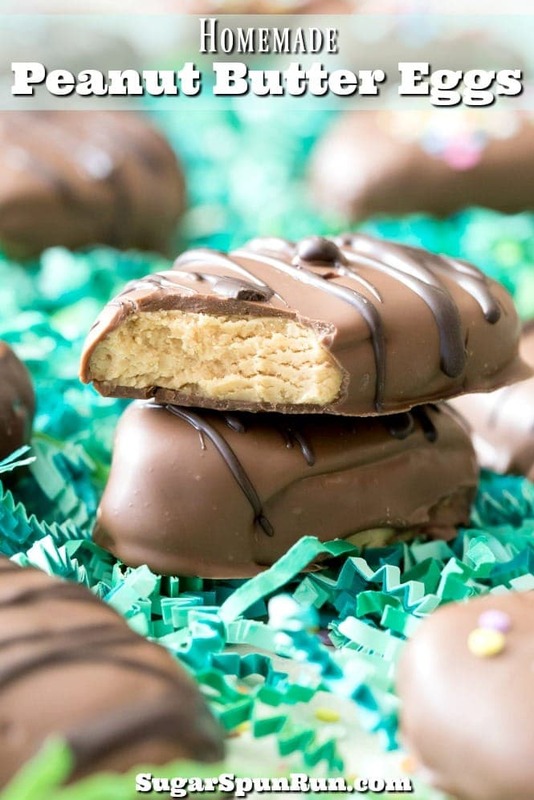 It consists of a simple creamy peanut butter filling surrounded by a simple chocolate shell. These can be prepped in under an hour and are fun to make, too! Check out the easy how-to VIDEO at the bottom of the recipe! 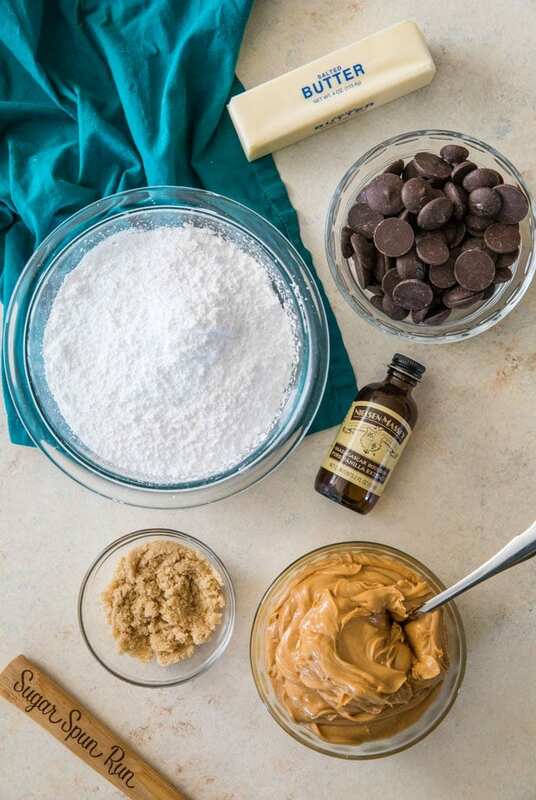 Combine creamy peanut butter and softened butter in a large bowl (or preferably in the bowl of a stand mixer) and use an electric mixer to beat until creamy and well-combined. Add brown sugar and vanilla extract and stir well. Gradually, about 1/2 cup at a time, add powdered sugar, mixing on low-speed until all sugar is absorbed and mixture clinging together. Be sure to scrape the sides and bottoms of the bowl with a spatula as needed. 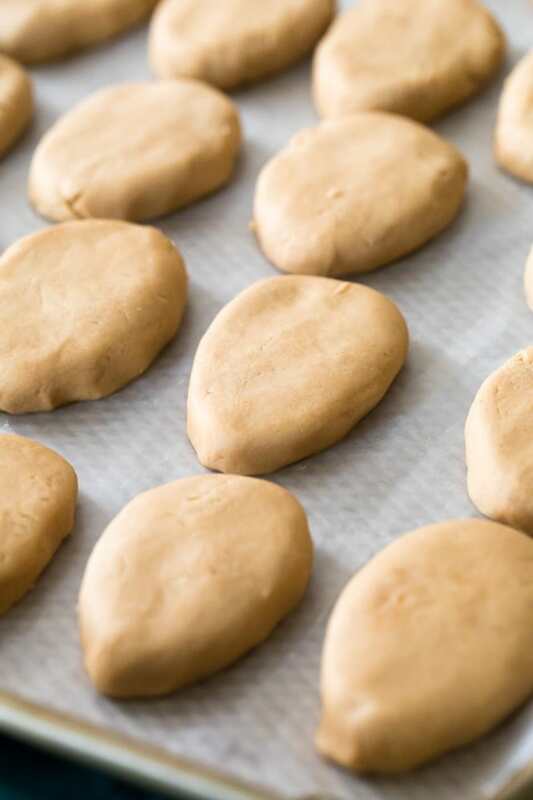 Once all ingredients have been well-combined, the "dough" should be pretty dry but you should be able to mold it together in the palm of your hand and form a ball easily. If it is too crumbly and not holding together, you can add a bit of milk or additional peanut butter, one teaspoon at a time. If it's too wet and sticking to your hands, add more powdered sugar, a Tablespoon at a time. Scoop dough by about 2 Tablespoons and roll into an egg shape. Flatten slightly (for a "Reese's" egg appearance) and transfer to a wax paper lined baking sheet. Once all dough has been rolled, transfer to freezer and chill for at least 15 minutes. Once chilled, prepare your melting wafers according to package instructions or prepare chocolate chips by combining chocolate chips and shortening and microwaving in 20 second intervals, stirring well in between, until chocolate is smooth and completely melted. Remove eggs from freezer and dip in melted chocolate (see my video below if you have any questions about my technique). Drizzle with additional chocolate if desired (I used the opposite color that I dipped the eggs in) and if decorating with sprinkles, sprinkle immediately over chocolate. Allow chocolate to harden before enjoying. If you used melting wafers this will only take minutes. If you used chocolate chips it will take much longer but the process can be sped up by popping the eggs in the fridge. ¹Some people have said they can taste a grittiness from the brown sugar in the finished product. I've never had this happen and think it might be a matter of the brand that I use. I use Domino Sugar brand which is not very coarse. You can omit the brown sugar if you prefer without making any additional changes. I just made these and they are fantastic. I’m taking them to my daughter’s for Easter tomorrow, along with the Hot Cross Buns, which I’m making now. Happy Easter. Peanut butter eggs are an annual Easter tradition in my family. Our recipe is pretty similar but adds cream cheese for a bit of extra flavor. It’s neat seeing everyone’s slightly different recipes this time of year! This is similar to something I made in my High School Home Ec class! Those eggs won me many friends! I will definitely have to try them. They are soooooo good, and this was the first thing I made that got me super interested in cooking….such as it was. lol I was only 16 at the time.